Some who come here may know booksie, some may not. 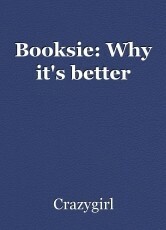 But the us more experienced members know just how great booksie is. But why is that? This is the answer. I have been part of countless online writing websites such as Wattpad, Fanfiction.net, I even tried blogging, and those are just a few examples. There have been many attempts at creating a good writing website. But out of all of them, Booksie tops them all. I may have only been a member for about 1 1/2 years, but believe me when I say I know. Every writer out there writes because they like it. Not because they're forced. And a lot of the time, we want to make our writing better. We want to share it with other people, though maybe not go through the process of writing a book. So, we look to the internet to make our dreams come true. But the thing is, if we use websites such as the more popular Wattpad, we have a very little chance at getting noticed. This is why Booksie is such a great place to come to. Because of how few people know about Booksie, it's a smaller community, which of course means just about everybody knows everybody! Or at least has the chance to. With forums where we can meet new people, make friends, and just simply having a bar at the side of the screen showing the "Welcome New Writers" gives us a chance to know everybody right as they come in. With houses that we can join and chat amongst those with common interests, and other ways some talk via messaging and quickees. We're tight knit, and that's the way we like it. At booksie we can publish with simply the push of a button! Here there are young writers and old, it doesn't matter how old you are, I for one, joined at the age of 12. There are no limits to where you can go with your writing. And everything's safe too! It's extremely rare to come across anything inappropriate or mean. Yes, there are some fairly rude members out there but I have met mostly nice ones. Most are more then willing to read your writing, maybe even fan you! Honestly, if you're active, you'll get friends fast! Now, I don't want this to sound like an ad or anything, but after even the short amount of time I've been here, I can really say that Booksie is without a doubt the best place for all readers and writers to come. I'd suggest it to anyone. Completely right- Wattpad's one that I have tried out before but found that the community there is too large for a new, never-been-published writer to be recognised and not very inviting. Booksie is the best by far. A great (and very true) article! Do you mind if I post this ( a link to it ) in the forum,? For others to read that might have missed it. I like this a lot and would love to share it. I would be honored for you to do so. Or, in other words: I'm inclined to concur with your evaluation of comparative efficacy of the aforementioned websites! How can we justify depravity?